In Colorado, child support is calculated using child support guidelines (formula). The guidelines are the same throughout the entire state. Therefore, Denver does not have separate child support guidelines. The Court can vary from the guidelines, but most Courts, including the Denver Courts, will not vary from the guidelines without an extremely compelling reason. There are exceptions and other complexities to the calculation of child support. For the purposes of this post, I am going to talk about the general factors you need to understand how the Colorado Child Support guidelines work. Gross Income: Each parent’s gross income is placed into the formula. If you are a salaried or full-time hourly employee this is relatively simple. Bonuses are included. Overtime is not considered gross income unless it is required as part of employment. Self-employed parties create a challenge for determination of gross income. Tax records and bank statements are usually utilized to come up with an average figure for income. However, depending on the circumstances of the self-employed individual, there may be disputes as to the party’s gross income. If a parent is voluntarily underemployed, the Court can base income on potential income, subject to certain restrictions. There is some complexity around certain sources of income such as stock options, deferred compensation, trust income and in-kind payments such as use of company cars. Support paid to another child of a previous relationship can reduce gross income. There are a multitude of issues that may affect the gross income of a party under certain circumstances. Overnights with the Child(ren): The second number that is placed into the calculation is the number of overnights per year that each parent has with the child(ren). If you are with your child all day but you return them to the other parent at night, that day does not go into the formula. Only an overnight counts. The more overnights you have, the less you will pay in child support and vice-versa. It is important to be realistic about overnights. Child support is established based upon the parenting plan the parties reach. If one parent receives a parenting time arrangement (for instance 50/50) and does not actually care for the child during their parenting time, the other parent receives less in child support and is still caring for the child more than contemplated. This issue can be brought back to Court in a Motion to Modify Child Support and Parenting Time but it is far easier and less expensive to get it right the first time around. Extraordinary and Ongoing Expenses: The third basic element to put into the child support formula includes any expenses that the child(ren) have on a regular basis. This could include regular medical expenses or extracurricular activities. Whoever is paying for medical insurance and/or child care can get credit for doing so in the formula. The formula generally shares these amounts in proportion to the parties’ gross income and credits the party accordingly. These are the basic factors for determining child support. Circumstances change. A party can request a modification of the initial determination of child support if there is more than a 10% difference in the child support obligation due to a continuing change in circumstances. This post is intended to provide a very basic understanding of child support in Colorado. Each circumstance is different and must be reviewed accordingly. An experienced Denver family law attorney can help you estimate an appropriate child support calculation in your case. If you have questions regarding child support, contact an attorney at Divorce Matters. 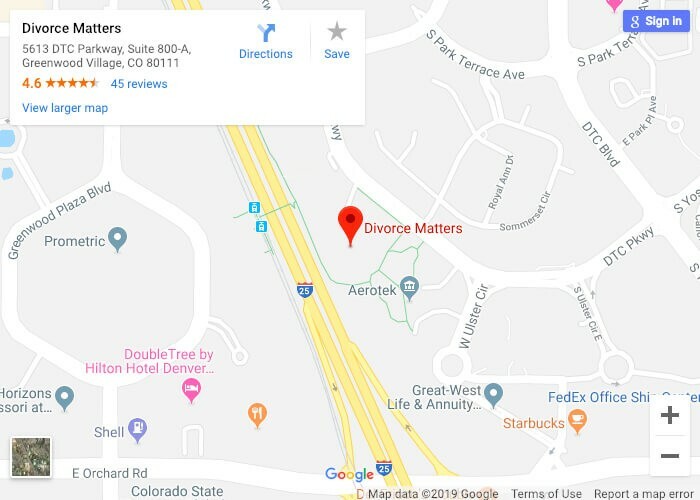 Posted by a Denver Divorce Attorney at Divorce Matters.